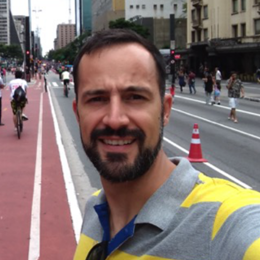 Dennis completed his master and PhD studies in Genetics and Molecular Biology at the Universidade Federal do Rio Grande do Sul (Brazil) focusing on HIV dissemination. Recently he joined KRISP as a Post-Doctoral research fellow under the supervision of Prof. Tulio de Oliveira. His research now focuses on HIV transmission dynamics based on a phylogenetic approach. Factors influencing HIV-1 phylogenetic clustering. Junqueira DM, Sibisi Z, Wilkinson E, de Oliveira T, Curr Opin HIV AIDS (2019), doi: 10.1097/COH.0000000000000540:. The effect of interventions on the transmission and spread of HIV in South Africa: a phylodynamic analysis. Wilkinson E, Junqueira DM, Lessells R, Engelbrecht S, van Zyl G, de Oliveira T, Salemi M, Scientific Reports (2019), 9:2640:https://doi.org/10.1038/s41598-018-37749-3. Combining Phylogenetic and Network Approaches to Identify HIV-1 Transmission Links in San Mateo County, California. Dalai SC, Junqueira DM, Wilkinson E, Mehra R, Kosakovsky Pond SL, Levy V, Israelski D, de Oliveira T, Katzenstein D, Front. Microbiol. (2018), https://doi.org/10.3389/fmicb.2018.02799:. Graf T, Fritsch HM, de Medeiros RM, Junqueira DM, Almeida SEM, Pinto AR , Journal of Virology (2016), 90(18):8160-8168.